From February through to April, my vegetable garden is at its peak: each week brings another tidal wave of fruit and vegetables through the back door and into the kitchen. The years of weeding, nurturing, staking, mulching, seed selecting and composting have paid off. Our vegetable garden is now nine years old and I often think it has a life of its own. Things pop up of their own accord, though I do have a small hand in this, allowing the prime specimens to go to seed. Time means nothing once I cross the threshold of the vegetable garden gate: it’s another world, another time zone, a spiritual place. I often enter with the simple intention of gathering a posey of parsley, then am overcome by something intangible. It is la terra del tempo perso, the land of lost time, but that time is definitely not wasted. The crops and the earth itself have ways of communicating their needs, more so in these challenging years of drought and changing climate. Lots of beans in March. Sometimes I look at a bed of struggling vegetable plants and I know that by adding a few shovels of well-rotted compost, the plants will thrive within a day or two. Compost is garden gold, especially here in the Shire of Nillumbik, the ‘land of shallow earth’ in indigenous language. I have 5 large bins in various stages of decomposition. The connection between compost and the kitchen is an important one. It is up there with the other daily kitchen tasks of recycling all waste that we generate through our consumption-plastic, glass, aluminium and paper- except that food waste has a much simpler solution. In my kitchen, a tall bucket lives inside a pull- out drawer under the sink. Anything that my chooks don’t fancy goes straight into the compost bin. This includes vegetable peelings and food scraps, fish bones, fruit skins, egg shells, newspaper wrapping, cooking oil, paper towels, tea leaves and spent coffee. Other paper products are added such as dockets and plain envelopes, non inked cardboard containers, and other plain paper packaging. It is one of the most important practices in my kitchen and is an ingrained, lifelong habit. I would feel incredibly guilty if I didn’t use this important resource: it would be akin to throwing away good food or wasting money. And my beloved vegetable garden wouldn’t thrive. Composting is an aerobic process that reduces or prevents the release of methane during the breakdown of organic matter so long as it’s done correctly. To not compost contributes to global warming, not to mention the costly exercise of councils having to take away waste that is a such a valuable resource to the home gardener. Worm farms also work well, though after killing my worms one very hot year, I haven’t returned to that practice. My recipe for compost making can be found here. Part of today’s pick. and always the excitement- what will I make? The Roma tomatoes are most fruitful this year, and are wonderful in this Retro Tomato soup. I’ve added a couple of grilled prawns on top for a bit of flash frugal: they ceremoniously sank for the photo. Sometimes I lay out an array of garden produce and let it talk to me about lunch. Today’s pick included carrots, corn, silverbeet, beans, and zucchini. The lovely Kipfler potatoes come from Hawkes, a farm in the hinterland of the Mornington Peninsula. The rest is from my garden. After removing the corn from the cob, the denuded cobs can be boiled with a little salt and fresh bay leaves for a corn flavoured stock. Just like that hilarious book on pig eating, Everything except the Squeal, I feel the same way about my garden produce and try to use every part of the plant. The chooks hang around the orchard fence waiting for lettuces and other greens that have gone woody in my garden. Only then will they lay good eggs, as their grassy run is now sadly lacking in green grass and shoots. Today’s soup. Corn, Hawkes kipler potatoes, onion, garlic, carrot, beans, half pureed. A healthy version of a chowder. Another marvellous find this week at Hawkes farm was a 4 kilo bag of just picked strawberries for $5. These are marketed for jam making and are often too ripe to sell. I usually make a big batch of jam but this week’s lot was in perfect condition- just oddly shaped. After hulling, I froze them in one kilo lots. Hawkes farm uses environmentally friendly packaging: this bag is made from corn and is compostable: no plastics or nasties have been used in the manufacture. The bag is now in our compost bin- it will be interesting to see how long it takes to vanish completely. I’m trusting the label which claims it meets Australian certified compostable standards which are more stringent than those of Europe. A nearby business in the village of Hurstbridge, Going Green Solutions sells Compost- a- Pak products in packs of 50 for AU$20. At 40c a pop, I hope I can re-use the bags a few times, especially for freezing bread as well as the annual crop excess. I love kitchen gadgets that work well and this Nutriblender from Aldi is a gem, especially given its powerful 120 watt motor. The motor churns through the fruits and veggies in under 8 seconds. Breakfast covered, and a great way to use our soft fruits that don’t store so well. Aldi’s Nutriblender. Main appeal is the powerful engine and price. Vampire breakfast. Watermelon, Mariposa plums, black grapes, frozen Hawke’s strawberries. The cucumbers are still prolific this year. A few cucumbers, some half peeled, plus yoghurt, salt, spices, and mint, are thrown into the jar of the new blender, buzzed for a few seconds, then voilà, summer cucumber soup. Just chill it. This year our fruit tree netting has been very effective in keeping out the birds. To date, we’ve harvested early peaches, three varieties of plums, early varieties of pears and apples and now, the table grapes. The sultana grapes are small and sweet, while the fat purple grapes have an interesting history. A little pot with a cutting was given to me by Vittorio, 8 years ago. A Siciliano who migrated here in the 1960s, Vittorio used to sell seedlings and small plants at a nearby market. This grape cutting was originally taken from a vine that had grown in his village. It probably is an ancient clone but we call it Vittorio after that lovely, generous man. Finally, returning to the dilemma of recycling, which is central to all our lives, especially in our kitchens, where we now sort and store our daily refuse, our local Council has just advised that our recycling will go to landfill this week, or we can ‘hold it back’ until a solution to the recycling crisis is found. Other shires around Victoria have openly announced that all recycling will now go to landfill. Will this be the tipping point that brings about change in our consumer patterns? Thanks once again Sherry, of Sherry’s Pickings, for linking our kitchen posts in the monthly series In My Kitchen. 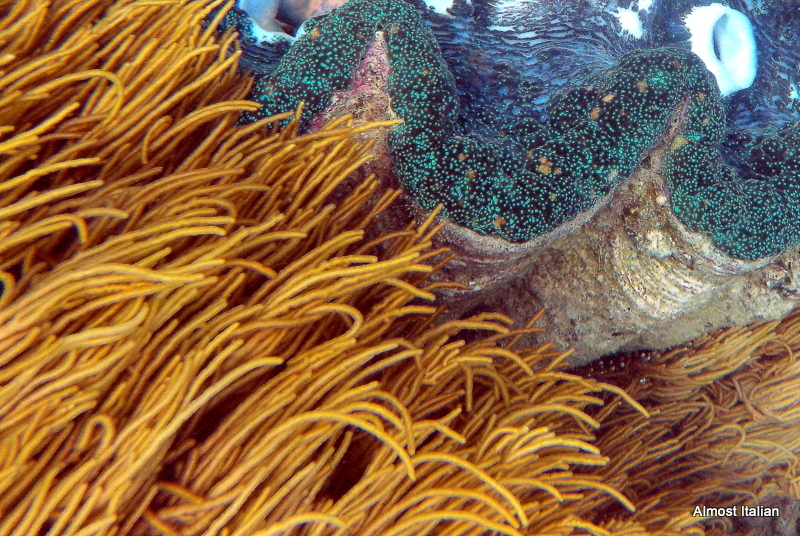 Under the sea, grass sways like a hula skirt around a giant clam. The underwater gardens of the Mackay Reef, off Cape Tribulation, in Far North Queensland, Australia are a natural wonderland. Global warming, the crown of thorns star fish invasion and coal mining, with its associated dredging and dumping off the coast, are the main threats to their survival.